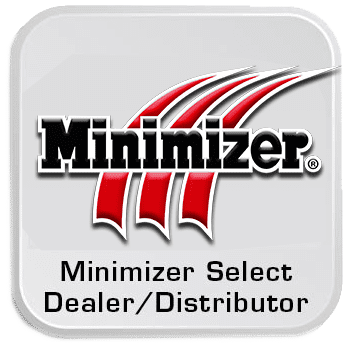 Minimizer is best known for their tough as nails poly fenders, and their custom fit floor mat tray systems. This company stands out from the rest and are unique to the industry as the products they create are designed and built by the hard working truckers that use these items every day. No one knows what kind of abuse these products must stand up to better than the truckers who use them everyday, for hours on end, weeks after week. The designs come from personal experience of product failures, or are developed simply out of need by drivers. Their fenders are made from a very tough, rugged, abuse resistant chemical compound called polyethylene, and they will never fade, crack, or rust. Another amazing feature of these trucker-designed fenders is the fact that color can be added directly to the poly as it is made. This means the color goes completely through the entire fender, and is not just applied on the surface where it is subject to sun damage, scratches or chips. The unique way these fenders are made, with the color throughout, make it so scratches, chips and dings do not show and they never need to be painted. Aside from fenders, Minimizer produces top of the line custom fit floor mat tray systems- designed specifically for YOUR truck. “Built by truckers FOR truckers” is their claim, and you sure can tell! Made specifically for the make and model of trucks by laser imaging the interior foot floor space in the cabs. Floor mats are available for most models of Peterbilts, Kenworths, Internationals, Freightliners, Volvos, Mack trucks, and soon to have a Western Star line as well. These floor mats are super heavy duty, can withstand mud, dirt, snow, water, spills and all kinds of other abuse. They stay securely in place, an issue many drivers have as their mats do not. They hook together and are pinned at the gearshift plate ensuring that they will not slide around like many cheaper floor mats do. However, they were designed to be easily removed for a quick and easy clean up. All products sold by Minimizer come with a lifetime warranty, so should there be any failure in the product, HCR Chrome Shop will quickly replace it to rectify the situation, and keep customer satisfaction as high as possible.